Levine's clothing store (right), a go-to shop for Waterville residents since 1904, before being torn down in September 2016. To the left is the former Camden National Bank building, which is currently being demolished and should be gone by mid-March 2019. Colby College bought both buildings and plans to build a 50-room boutique hotel on the sites. It is part of a broader downtown revitalization plan for the city. 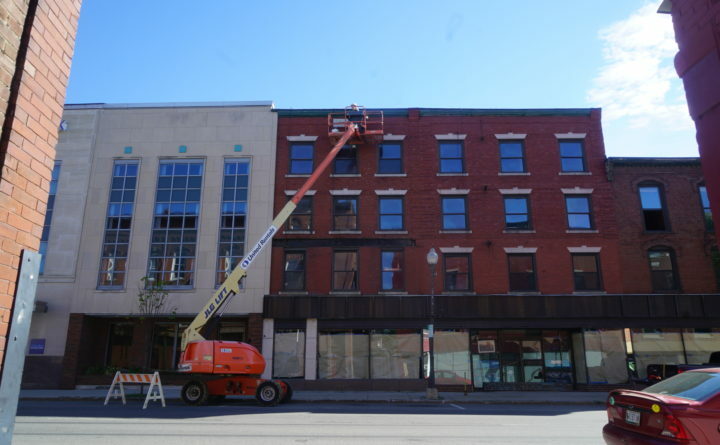 A boutique hotel slated to be built where a landmark Waterville clothing store once stood will be larger than originally planned. Colby College said the hotel, still in the planning phases, was to have 42 rooms but now will have 50. That’s because the college was able to buy an adjacent piece of land, said Brian Clark, vice president of planning at Colby and head of the committee that is developing the hotel. The college owns 9 Main St., the former home to Levine’s, a clothier founded in 1891 that closed in 1996. The building already has been demolished. Colby bought it for $200,000 in July 2015 as part of a broader downtown revitalization strategy. The college also bought the adjacent lot at 33 Main St., which was home to a Camden National Bank branch, for $750,000 in June 2018. Camden National moved into a new Colby building on the other end of Main Street. “The acquisition of that property gave us a larger site for the hotel,” Clark said. He said demolition on the building at 33 Main St. started two weeks ago and the site should be cleared in mid-March. Construction on the hotel is to begin this summer. It is expected to open in 2020. Colby’s development arm, Elm City LLC, owns the hotel. The college plans within the next few weeks to announce the names of the architect and developer for the hotel. The hotel was delayed at least a year after Colby fired the original developer and prospective hotel manager, The Olympia Companies, in January 2018, and took over the project itself. The dismissal came after a woman filed a lawsuit against Kevin Mahaney, owner of The Olympia Companies, alleging he was connected to a sexual assault case. She later withdrew her claim against him. Clark said the relationship with The Olympia Companies is terminated and declined to comment further. The delay and the extra space at 33 Main St. gave Colby a chance to rethink its plans for the hotel. Waterville hasn’t had a downtown hotel since the heyday of grand hotels in the late 1800s to mid-1900s. At the time, The Elmwood Hotel, whose location is now a Rite Aid, attracted events to its ballroom. The Crescent Hotel greeted visitors driving into the city from Winslow. Today, chain hotels are clustered near Interstate 95 exits 127 and 113. Clark said the new hotel will not be part of a chain and will remain independently operated. “It will have distinctive elements,” he said. The restaurant will be near a group of other downtown restaurants to give Waterville visitors options. Clark envisions different guests to the hotel, including those affiliated with the college, alumni, students’ parents, visiting professors and leisure guests. “The Colby Museum of Art alone gets 50,000 visitors each year,” he said. There also are other arts attractions in downtown, including the Waterville Opera House. “We want to give guests a more full-service experience than they’d get in [other parts of] Waterville and central Maine,” he said. He and his hotel committee are still working out the details of the hotel’s amenities. And they’re doing so thoughtfully, well aware of the history of the hotel area. Sen. George Mitchell grew up on Front Street, which runs along the back of the former Levine’s, in what used to be a large Lebanese community. Former U.S. Secretary of State Edmund Muskie once had an office a block away from the store, Clark said. The brothers, who remained bachelors their entire lives, shared the same house where they were born. They died a year apart, in their 90s. The two were Colby alumni who also were among the Colby College Mules’ biggest boosters. The were seen on the sidelines of football games for 70 years, enthusiastically cheering on their team. “We’re looking to make the location one of the premier hotel destinations in the entire state,” Clark said.